With the cost of utilities commonly a top five corporate expense and the energy industry changing at a record pace, good energy management is increasingly complex in today’s competitive business environment. It’s very likely energy procurement is just one of your daily responsibilities making it tough to stay on top of shifting energy trends. 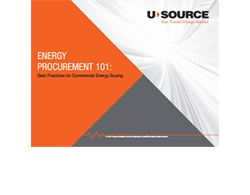 In this white paper, we’ll explore four energy procurement best practices that will help you navigate your way through this complex process. We’ll also touch on the three ways your organization can buy energy in a deregulated market.